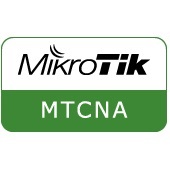 The MikroTik Certified Network Associate (MTCNA) is MikroTik's introductory certification course designed for network engineers and technicians wanting to deploy and support corporate networks and client CPEs (WISPs and ISPs). By the end of this course, the student will be familiar with RouterOS software and RouterBOARD products. The student will also be able to configure, manage, do basic troubleshooting of a MikroTik router and provide basic services to clients.